The Wild Mushroom Stew recipe below is from The Nourished Kitchen: Farm-to-Table Recipes for the Traditional Foods Lifestyle Featuring Bone Broths, Fermented Vegetables, Grass-Fed Meats, Wholesome Fats, Raw Dairy, and Kombuchas, the new cookbook by Jennifer McGruther. 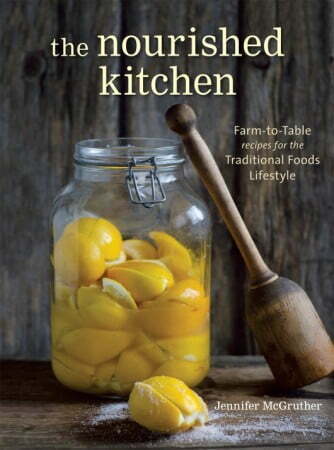 Check out my post from the other day: It's not a cookbook, it's a work of ART! As the afternoon rains of late summer fall in step with the emerging coolness of autumn, mushrooms erupt in the forested hills and high alpine valleys that surround our little town. I take my little boy by one hand and a basket in the other, and we walk to where the edge of town meets the little hills that will soon turn into mountains. During good years, when heavy winter snowfalls meet a wet summer, we find plenty of mushrooms, each with their own unique appearance, flavor, and texture. Hawk’s wing—a broad, toothed mushroom—tastes of pine, while the creamy‑colored oyster mushroom tastes, as you might imagine, faintly of the sea. There’s the mild-flavored shaggy mane that grows not only on the forest floor but also in suburban lawns. My favorite are the creamy‑colored, cinnamon‑capped king boletes, or porcini mushrooms, and the golden chanterelles. Porcini mushrooms taste rich, earthy, and meaty, like a good mushroom should, while chanterelle mushrooms have a more delicate floral and citrusy flavor. Any mushroom variety works well in this soup, but the key is to use multiple varieties, whether you bought them or gathered them yourself. 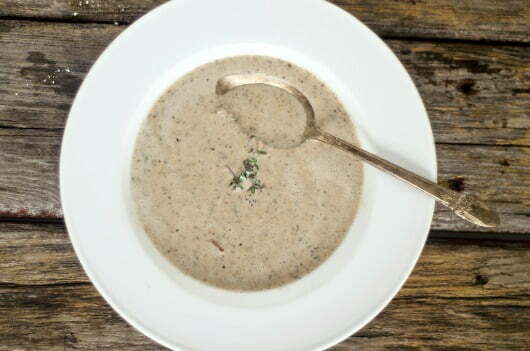 Each mushroom offers a distinctive flavor and aroma, and, when layered together, the soup develops a rounder and more complex flavor that’s enhanced by sherry and thyme. Melt the butter in a heavy stockpot over medium-high heat. When it froths, turn down the heat to medium-low, stir in the shallot and thyme, and sauté until fragrant, about 3 minutes. Toss the mushrooms into the pot and sprinkle with the salt and white pepper. Cover the pot and sweat the mushrooms until tender, about 10 minutes. Stir in the broth and simmer, uncovered, for 20 minutes. Turn off the heat and puree the soup with an immersion blender until smooth. Stir in the sherry and heavy cream and serve. I slow-roast a chicken every Sunday for my family, and I always reserve the chicken’s spent carcass to make a simple savory broth that will nourish us throughout the week. Simmered in water and wine with fragrant herbs, the chicken carcass releases the flavor of its bones and marrow into the pot, and the minerals of its bones dissolve into the smooth yellow liquid. With prolonged cooking, the bones will break away and crumble when pressed between your thumb and forefinger, and then you know the broth is finished, for the bones yielded everything they could. A good broth will solidify and gel when chilled because the prolonged simmering in water made slightly acidic by wine helps to release amino acids and collagen from cartilage-rich joints. This gelatin-rich broth aids with digestion while also yielding beautiful body to any soups or sauces made from the broth. I often drink broth in the morning with a clove of minced garlic and a bit of parsley and sea salt. Feel free to use this for any soup recipe! Combine the chicken carcass, onions, celery, carrots, peppercorns, thyme, parsley, and bay leaves in a large, heavy stockpot. Pour in the wine, then cover the chicken and vegetables with the cold water. Bring to a boil over medium-high heat, then immediately decrease the heat to medium-low and simmer, covered, for 12 to 14 hours, adding water as necessary to keep the bones submerged. From time to time, skim away any scum that might rise to the surface. The foamy scum isn’t harmful, but it can leave the broth with a very faintly acrid or dirty flavor. Strain the broth, discarding the solids, then pour it into jars, cover, and store it in the refrigerator for up to 1 week or freeze for up to 6 months. As the broth cools, a bit of fat might float to the surface and then harden with chilling. You can scrape it away and discard it, or use it as you would any other cooking fat. I am definitely going to try this recipe. When I make mushroom soup I usually use beef bone broth and a splash of red wine.